I pulled the walnut sized seeds off and placed them in water. They floated! Are they good to plant or should I wait a few more days? 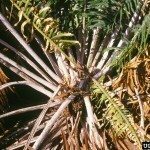 Sago palm seeds are covered with a fruit wall that you should remove before planting the seeds. To soften the coating, soak the seeds in water for at least 24 hours. If the coating doesn't give, soak them for longer and change the water daily. Sago palm seeds require well-drained, loose soil to grow. Fill a 4-inch diameter pot with a commercial seed-starting mix or a combination of equal parts of perlite and peat moss. Tamp the soil to level the surface. Push the seed sideways in the soil. Avoid burying the seed -- keep about one-third of the seed above soil level. Tamp the soil so it's firm around the seed, and moisten it with water. Cover the pot with plastic wrap to keep moisture in. Sago seeds need a temperature between 70 and 100 F to germinate. Place the pot on a heating mat to provide a consistent temperature. Keep the soil damp throughout the germination period. Once the seeds germinate -- within about one to three months -- remove the plastic wrap and place them in a sunny window. Transplant the sago palms into larger pots as they grow. Germination rate is very low for seeds.